What do I need to register an aircraft online? If you are a DEALER – STOP! Do NOT use the Online Aircraft Registration site. Registration fees collected support the Division’s efforts to maintain backcountry airports, conduct search & rescue operations and provide all of the services Aeronautics offers. Aircraft Registration Application – For newly acquired aircraft, or new to Idaho, whether privately owned, business owned, or charter/leased aircraft. Aircraft Registration “Status Change” Form – Used by anyone making changes to their aircraft status, change of personal or business contact information, or by Dealers updating their inventory during the year as their inventory fluctuates. Dealer Registration and Inventory Application – For those applying for Dealer Registration, or when a Dealer is reporting his/her aircraft inventory at the beginning of a new registration year (currently for sale and flown for demo purposes only). Dealer’s are required to provide the Idaho Division of Aeronautics with information regarding the ownership and aircraft details for each aircraft in their inventory. Dealer registration fee is $40 per year plus $1 for each decal. Dealers must also register planes flown for their personal or business use separately. Flying State aircraft is the safest, fastest, most reliable and cost-effective mode of transportation available for the employees of the State of Idaho. Contact Tammy Schoen, Flight Scheduler, at 208-334-8776 or email Tammy.Schoen@itd.idaho.gov for a cost estimate or to book a flight. The Idaho Airport Facility Directory is available on iPads, iPhones, and Android devices. The Idaho Transportation Department’s Division of Aeronautics serves to provide the highest quality, most effective, efficient, and safest airport system for all users of aviation services. To this end, the Division of Aeronautics plans and implements essential programs, services and projects to develop, encourage, and foster an exemplary system of airports that meet the current and future requirements of a growing and diverse Idaho aviation community. In an effort to streamline pilot reporting at the backcountry strips, and offer documentation in one place, Aeronautics is recommending use of the Idaho Aviation Association (IAA) webpage for Idaho Airstrips. The Idaho Airstrip Network Steering Committee continues working towards full implementation of the Action Plan which was approved by the Idaho Transportation Board (ITB) in July of 2005. The Idaho Transportation Department (ITD) Division of Aeronautics recognizes the significance of a proactive approach to ensuring aviation’s role in the statewide transportation system. The Idaho Airport System Plan (IASP) provides the ITD-Aero an opportunity to stay abreast of changes in the aviation industry and to determine how Idaho’s airports should be positioned to respond to future needs and challenges. Idaho’s State Airport System Plan provides input for federal planning documents. The Federal Aviation Administration’s (FAA’s) National Plan of Integrated Airport Systems (NPIAS) is updated every two years. The FAA provides money for eligible airport development from the Airport Improvement Program (AIP). Airports must be included in the NPIAS for their projects to be eligible for AIP funding. Recommendations from the Idaho Airport System Plan will be included in the NPIAS. The IASP is the Idaho Transportation Department’s comprehensive plan for linking statewide aviation facilities with those of the nation and the world. Idaho’s system plan also works in concert with Idaho’s Transportation Vision. The Transportation Vision examines all of the state’s transportation needs and sets the direction for making improvements and investments in all modes of transportation. 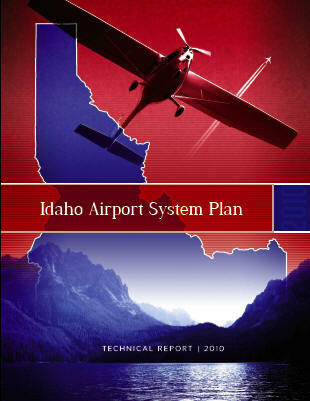 Click below to review the Idaho Airport System Plan. Like the highway system, Idaho’s system of 126 public use airports are a critical component of the state’s transportation system. And, also like the highway system, constant maintenance and improvements are necessary to meet the needs and demands of the traveling public. Simply put, current aviation system needs far outweigh available funding. The State Capital Improvement Program (SCIP) is tackling the challenge of targeting state and federal resources in a more strategic way by better identifying and prioritizing aviation related projects. This process helps ITD-Aeronautics and local governments communicate to decision-makers the need for continued and increased investments into Idaho’s airport system. The program is intended to be a continuous, multi-year funding program that will assess short-term (0-5 year) and long-term (5-20 year) airport improvement needs for the Idaho airport system. The SCIP is helping agencies including ITD-Aero, the Federal Aviation Administration (FAA) and local governments to better anticipate future airport development capital needs and to make strategic investments to maximize financial resources. A program for airports eligible for FAA Airport Improvement Program (AIP) funds. A program for airports only eligible for Idaho Airport Aid Program (IAAP) funds. For AIP eligible airports, the SCIP program is being developed in partnership with the Federal Aviation Administration (FAA) Northwest Mountain Region and the FAA Seattle Airports District Office (ADO). The Seattle ADO is the primary FAA regional Line of Business overseeing airport development and funding in the states of Idaho, Washington and Oregon. In support of this partnership, the FAA has provided ITD-Aero with a grant to develop an AIP eligible SCIP. Capture for the first time at the state level both the constrained and unconstrained needs of Idaho airports. This data will be used to demonstrate to state legislators and other local decision-makers the financial needs to maintain and enhance this critical component of the statewide transportation system. Use the process developed in partnership with the FAA for federally funded airports for non-federally funded airports within Idaho. Increase predictability, consistency, and efficiency amongst ITD-Aero, airport sponsors and FAA when prioritizing and distributing Idaho airport capital improvement funds. Eliminate duplication of efforts. ITD-Aero will be responsible for the annual collection of CIPs from airport sponsors, which will alleviate airport sponsors from having to duplicate communication with both the FAA and ITD-Aero. Maximize efficiency by designating ITD-Aero as the organizer of CIP submittals. ITD-Aero will then work with the FAA to provide a more timely response from the agencies back to airport sponsors regarding their CIP requests. Increased resources for airport sponsors to discuss your individual airport CIP and airport needs. The ability of Idaho to work with the FAA and airport sponsors to better incorporate statewide aviation needs into the overall SCIP development process. More efficient use of available AIP funds to Idaho airports as well as the potential for increased access to certain AIP funds as a result of better SCIP planning. Create a proactive, continual planning process for years to come. This will result in a more sustainable airport system, enabling ITD-Aero, FAA and local governments to look ahead to determine how the system can continue to be improved and preserved. As a new program within ITD-Aero, full development and implementation of this program is expected to take two to three years. Over the coming months ITD-Aero will be visiting with airports to discuss the program, answer any questions and gather input about existing CIPs. Stay tuned – More information will be added to this website as it becomes available . The Idaho Airport Aid Program (IAAP) provides for the discretionary allocation of grant funds to Idaho airport owners. Only public entities are eligible to participate in the Idaho Airport Aid Program. Any county, city, village, or agency designated in Idaho Code, shall be deemed an eligible public entities for the purpose of participation in the Idaho Airport Aid Program. The funds are derived from Idaho’s Aviation fuel tax. The IAAP is a Trustee and Benefit program providing matching funds to municipal governments for public airport improvements. Allocations must meet high priority needs and achieve maximum benefit and use of available funds. The allocation program is designed to provide the greatest and best utilization of limited Idaho Airport Aid funds and maximize availability of Federal funds. The primary goal of the allocation program is to further the proper development of statewide system of airports and fair distribution of aviation tax money. It is a modest program with a budget that varies from year to year. There are basically six areas where we provide assistance. Primary Airports – We provide about ±19% of our annual budget to our seven commercial airports. Funding is calculated upon the relative level of activity. This may be used to match any other source of funding. GA NPIAS Airports – We provide about ±40% of our annual budget to 31 NPIAS GA airports. We provide half of the local match required for a FAA-AIP Grant. This covers State apportionment funds, non-Primary Entitlement funds, and GA discretionary funds. GA non-NPIAS Community Airports – We provide about ±30% of our annual budget to 30 non-NPIAS airports. These airports receive no AIP funding and must rely on the State of Idaho for assistance. We pay between 50% and 90% of the project costs depending upon the size of the community. Airport Maintenance and Safety Supplies – We provide about ±1% of our annual budget to supply airports with cost effective maintenance items such as lamps, light fixtures, wind socks, lens and other items. Simply, we purchase in bulk and provide the smaller quantities of items to the public airports at or below cost. Small Projects – We provide less than ±1% of our annual budget for one-time unscheduled and emergency projects that cost under $ 2,000. This ranges from wind sock standards, to tie down chains, crack sealing, radio operated light switches, etc. Small Airport Planning Studies – We provide about ±9% of our annual budget to small communities and state-operated airports to prepare current airport planning documents. We also provide a consultant and any airport information available in exchange for the airport operator seating a planning advisory committee. Such studies usually include a Narrative Report with a Capital Improvement Program (CIP) and a Land Use and Zoning Plan as well as a drawing set including at least an Airport Layout Drawing, Airspace Drawing, Property Drawing, and a Land Use Drawing. The IAAP is administered according to the Idaho Administrative Code IDAPA 39.04.04. This rule requires that an airport owner must have a State approved airport plan (section 200.01), and protective zoning (section 200.04) in place in order to participate in the IAAP. However, if they do not have a plan or protective zoning in place, or if these need to be updated, the IAAP can provide funding for those items. The airport owner may use force account (in-kind) work as part, or all, of their required match for IAAP funded projects. The value of the force account (in-kind) work shall not exceed the amount to the Sponsor/Owner’s designated match for this project. The type, amount, and value of the in-kind work must be estimated and approved by the State before the start of work. The owner may use their own internal rates, or the rates listed in the Idaho Transportation Department Standard Specifications for Highway Construction. The airport owner must also show that the use of force account (in-kind) work is in the public interest and must demonstrate that it can accomplish the work with equal to or better quality, and for equal to or less than the cost of having it commercially done. Additionally, volunteer labor, materials, and/or equipment must be listed as force account (in-kind) contributions. The following lists identify what projects are eligible under the grant program and the general priority of those projects. Preservation and acquisition of existing landing facilities in danger of being lost. Projects at existing airports that demonstrate need and provide statewide benefits. Projects improving aircraft operational safety. Projects to maximizing use of federal funds. Projects to protect prior public investment. The Division of Aeronautics is under contract with the FAA to inspect 118 public-use airports in the state of Idaho. These inspections are conducted on a three year cycle. The inspection includes verification of airport data, services, and evaluation of runway/taxiway surfaces and navigation aids. Airport Facility Directories and Charts issued by both the State of Idaho and the Federal Aviation Administration are updated using information gathered during the inspection. Interaction with Airport Managers or sponsors during the inspection provides an opportunity to address safety and maintenance issues. Between inspections, airport managers or sponsors can assist in keeping airport specific data current by contacting the Aviation Technician to report changes or corrections. The Division of Aeronautics evaluates structures under the authority of Idaho Code 21-513 through 21-520 and Idaho Transportation Rule No. 39.04.02. All proposals for structures in excess of 199’ or those of a lower height located near a public-use airport are evaluated for impacts on aircraft navigation. Mitigation of aviation hazards typically involves marking and lighting of structures. Proponents of vertical structures can contact the Aviation Technician if questions regarding location, height (and the need to notify the Division of Aeronautics of a proposal) arise during the project planning phase. Notification of the Division of Aeronautics prior to construction best accomplished by submitting a copy of the FAA form 7460-1 to our office. This form contains all the information the State of Idaho needs to accurately evaluate a structure and its location. You can find a link to this form at: https://www.faa.gov/forms/index.cfm/go/document.information/documentID/186273. It should be noted that proponents of structures described above are required to notify the Federal Aviation Administration to allow that agency to evaluate the structure for impacts on the national airspace system. Following is a list of airport materials that are available from the Idaho Transportation Department, Division of Aeronautics. The material may be ordered for use on any public owned, public use airport in the state of Idaho. These items are normally kept in stock and are available for immediate shipment. Items listed are provided free of charge. For supplies not listed, the Division of Aeronautics may be able to provide source information to airport managers/owners. Please order item by description. Order by mail, e-mail or telephone. Please include your Name, UPS shipping address and telephone number. Items will be shipped by the most convenient and economical means. You may contact us for needed items that do not appear on the following list. We maintain a selection of commercial airport material catalogs and can usually special order any item you may need. Incandescent Style, Medium screw base, Buildings, Obstruction Lights, etc. 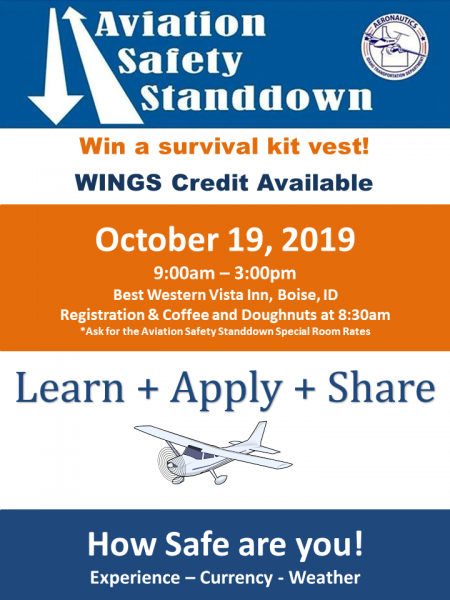 Safety Standdown: October 19, 2019, Boise | Best Western Vista Inn from 9:00 a.m. to 3:00 p.m. These are proven operating practices that will ensure your Idaho flying experience is a safe and enjoyable one. Aerospace Career Exploration (ACE) Academy is designed to introduce high school students to aviation and space related careers. As a participant in the ACE program, activities may involve field trips, forums, and a hands-on satellite project. Art students from across Idaho may submit their Aviation art to win great prizes. First place winners in each group will be invited to ride in an airplane; receive a copy of their artwork signed by our Governor plus a framed congratulatory letter; and be recognized in our Rudder Flutter newsletter. Second place winners will receive $25 in art supplies, a congratulatory letter, and recognition in Rudder Flutter. IAASC Report – This Idaho Aviation Accident Score Card (IAASC) provides details on all Idaho aircraft accidents that have occurred from the NTSB’s latest Probable Cause issuances. The source of data accumulated in this IAASC is compiled directly from the NTSB aviation database. IAASC specifically includes total number of fatal accidents, fatalities, class of aircraft, pilot qualifications, and weather conditions at the time of the accident. In addition, IAASC provides an overview of Idaho aviation safety trends while final investigations of these accidents are being conducted by the NTSB. It will be published annually during the first quarter of the following year and a brief summary will be added to the spring issue of the Rudder Flutter. For ideas, comments or suggestions, we would be glad to hear from you. Stay informed. Provide your e-mail below and we will send you Division of Aeronautics updates. The “Rudder Flutter” is published bi-annually and is available in print, via email, and online. Select from the editions in the table below to review past issues of this Idaho aviation newsletter. Scheduled commercial airline service is a cornerstone of Idaho’s economy. Businesses, residents, and visitors all depend on commercial airline service. A study undertaken by the Idaho Transportation Department in 1998 showed that annually, Idaho derives at least $1.2 billion in annual economic benefit from activities at its seven commercial airports. These economic benefits are derived from spending by visitors who arrive in Idaho via the scheduled air carriers and from the activities of businesses and tenants located at each of the commercial airports. Recognizing the importance of commercial airline service, the Idaho Transportation Department, Division of Aeronautics, undertook a study to assess current demand in each commercial airport’s market area. This report provides a summary of the findings from that study. The State of Idaho and the Transportation Department have no input whatsoever as to the content of Internet data, with the exception in part of the Transportation Departments own home page. The State of Idaho and the Transportation Department do not endorse the viewpoints or vouch for the accuracy or authenticity of electronic data or information available via the Internet. The State of Idaho and the Transportation Department will not deny or limit access to the electronic data or information available via the Internet because of its allegedly controversial content or frivolous value. Information retrieved or utilized electronically is considered constitutionally protected until such time as otherwise determined by a court of competent jurisdiction.